This blackberry ice cream is homemade goodness made with fresh blackberries, sugar, eggs, heavy cream, creme fraiche or crema, and lime juice. Created by Mexican desserts guru Fany Gerson. The Mexican crema called for in this homemade blackberry ice cream recipe is essentially the same thing as French crème fraîche. Neither form of soured cream is as tart as American sour cream. And, unlike sour cream, neither will they break down when heated, which is essential when making the ice cream custard. You might want to omit the salt in the blackberry swirl if you use Mexican crema, which sometimes has salt added. 1. Combine the blackberries, confectioners’ sugar, and corn syrup in a small saucepan and stir to mix. Add a pinch of salt and bring to a boil over medium heat. Reduce the heat and slowly simmer, stirring occasionally, until the berries have a thick, jam-like consistency, 15 to 20 minutes. Remove from the heat and let cool. 2. Strain the mixture, pressing the solids with the back of a spoon. Discard the seeds. Cover and refrigerate the blackberry swirl until chilled through. 3. Whisk the granulated sugar and egg yolks in a medium bowl until smooth. Bring the heavy cream to a gentle simmer in a saucepan over medium heat. Remove from the heat. Slowly whisk about half the hot cream into the yolks until smooth, then pour the mixture back into the saucepan. Place over medium-low heat and stir continuously, being careful not to let the mixture come to a simmer, just until the custard mixture thickens and coats the back of a spoon, 5 to 10 minutes. If you have an instant-read thermometer, the custard is done when it reaches 175 to 180°F (79 to 82°C). Remove from the heat. 4. Strain the custard into a bowl, preferably stainless steel, and whisk in the crema, vanilla, lime juice, and salt to taste. Cover with plastic wrap, placing it directly against the surface of the custard so a skin doesn’t form as it cools. Place the bowl in the refrigerator to chill completely, about 5 hours. 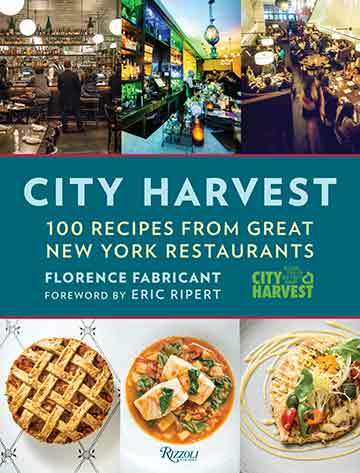 Blackberry Ice Cream Recipe © 2015 Florence Fabricant and City Harvest. All rights reserved. All recipes and photos used with permission of the publisher. The looks on my family’s faces said it all. Translation goes something like, “Oh my god, what is this? !” My advice to you is that if you don’t have an ice cream maker you should go buy one and never stop making this blackberry ice cream. It’s that good. I will never make plain old vanilla ice cream again, it will be crème fraiche ice cream from here on out. The custard base can stand alone if you just want plain. But you could also play with whatever jam swirl you want to add. I’m seeing possibilities for raspberry, blueberry, really any type of jam that you like stirred in at the end. Two things brought me to this recipe. Store-bought crème fraîche ice cream has been my new favorite ice cream for the last year. And blackberries. They grow wild all over the Pacific Northwest—along trails, by the side of the road, heck, they even sell blackberry vine killer at Home Depot because blackberries grow wild in backyards. Just get a hold of some blackberries any which way you can and make this treat. And throw some blackberries in your freezer so you can enjoy this long past blackberry season. I pulled the custard from the stove when it reached 180°F. I also cooled the pan in a cold-water bath just to make sure it wouldn’t keep cooking. The texture was very creamy, with a very rich mouth feel. The homemade blackberry ice cream itself is rich and a small portion is perfect. Really delicious and such a very creamy summer treat. The tart-sweet blackberries work so well with the rich creamy custard and that small barely noticeable hint of salinity in there is so welcome along with everything else. So, yes, I loved this blackberry ice cream. As far as cooking the custard, I stirred until the mixture reached about 175°F. That's it. I really loved the texture of this ice cream made with my homemade creme fraiche and heavy cream instead of the typical mix of milk and cream in most ice creams. It's rich and creamy but works great with the sharp fruit flavors. The ice cream keeps well and is very easy to scoop from the freezer (due to all the cream, I'm sure). No worries about consuming it within a few days. It's been a week and it still tastes superb. Just always press a piece of parchment or wax paper directly on the surface before sealing with the lid after every time you scoop from it. You might want to omit the salt in the fruit if you do use Mexican crema that has salt added. This homemade blackberry ice cream recipe is a 10. The instructions say to consume within a few days. No worries there. All gone the next day. The blackberries at the farmer's market were gorgeous and I had heavy cream and buttermilk that I used to make homemade Mexican crema. Rather than bringing the heavy cream to a simmer in saucepan over heat, I microwaved it for 3 minutes, stirring every 30 seconds. After tempering the eggs and sugar with 1/2 the warmed heavy cream, the custard mixture was fairly thick already. Back in the microwave at 10% power, it took only another 1 1/2 minutes, stirring every 15 seconds, to get a thick custard mixture thick enough to coat the back of a spoon. I strained the custard mixture twice, whisked in the crema, vanilla, lime juice, and salt, and strained it again. I debated its expense for two years but the Whynter ice cream machine has been my favorite kitchen investment because it processes warm custard! (I use it more than my VitaMix!) 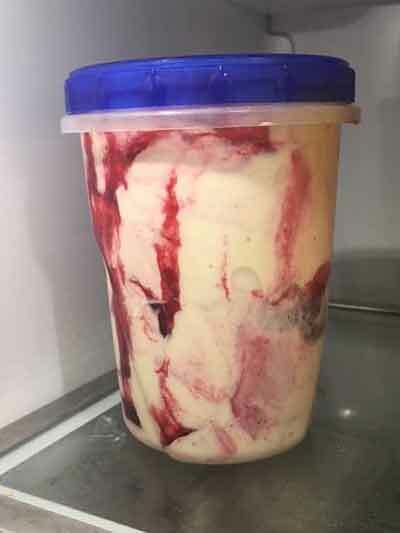 I let the ice cream maker do most of the work by putting the blackberries on top of the “almost there” ice cream, processing it for another 5 minutes, and finishing the swirl when putting it in the freezer container. In 3 hours, the ice cream was perfect with a just-north-of-soft-serve and gloriously smooth texture. Ok, here I am again asking ridiculous questions that probably I could find answers to here between the lines…I doubt in our grocery store I will find Mexican crema or French creme fraiche. How do I make my own with buttermilk and heavy creme as Sharon mentioned? Thank you! As soon as I saw this recipe posted I was in! 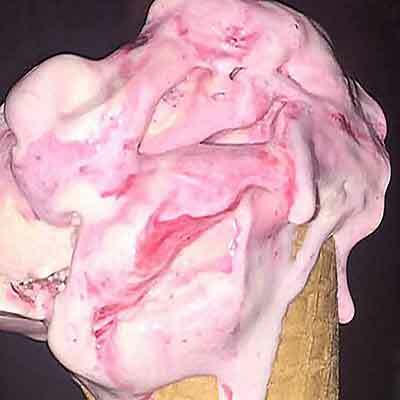 Nothing reminds me of fond summer childhood memories like blackberry/black raspberry ice cream…in a sugar cone. This was a very simple recipe to make. Simpler than my other favorite ice cream bases. It came out creamy and tart and amazingly decadent. I, of course, broke my cardinal rule. I did not read the recipe all the way through before starting the process in any way. My local co-op was out of both creme fraiche and Mexican crema (which in Santa Fe normally is no problem to procure and since I failed to read the bit about sour cream separating, I figured why not go a little tart and I finally found a good excuse to buy that tub (with WAY more than I needed) of Kalona organic sour cream. Naturally I was concerned so I made a little adjustment and cooled the custard in an ice bath before I stirred it, along with the vanilla and lime juice, into the base. Worked like a charm! I love the results and can’t wait to serve with some juicy ripe summer peaches for a “reconstructed” Peach Melba for dessert tonight. Wow, Lauren, that looks fantastic. So glad you liked the recipe. And the swirl pattern is wild. Now, I have to make another batch! I must have done something wrong. I followed the directions for the Blackberrys and got exactly three drops, no matter how hard I tried to push the mixture through the strainer. Not giving up though. Any tips for next time? Margaret, I’m really sorry to hear that. None of our home testers had that experience. It sounds as if perhaps you reduced the blackberry mixture a touch too much. If there’s not enough liquid or moisture left, you won’t be able to have a jammy consistency. So as not to waste what you have—blackberries aren’t cheap!—perhaps you could spread it on toast or incorporate it into a smoothie? As for the next time, use a very low heat and don’t reduce the mixture quite as much. Leave it more loose than jammy. 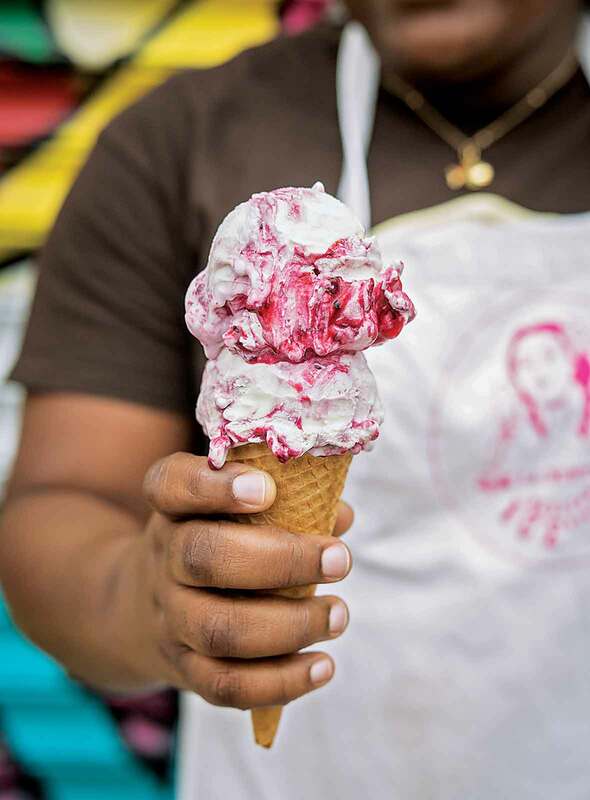 And kindly let us know how it goes as I want to make certain you experience just how lovely this ice cream can be. Thanks! That’s kind of what I figured. I’m definitely trying again. Going out for blackberries now. I bet this works well with black raspberries too. I am wondering though about the lime. Personal preference is to keep the seeds, I love the texture! Penny, just when I thought I couldn’t love you any more, you go and mention black raspberries. I think they would be brilliant here. Many, many thanks for the lovely suggestion! I loved this ice cream. I had to make my own crème fraiche, but it was so worth it! Fresh blackberries picked on my little farm and this recipe, heaven on earth. Beauteous, Rita! I envy you your blackberry bush!